Obituary – Martin, Ruth Marguerite « Perry High School Alumni Association, Inc.
Normal Training, Orchestra ’23, D.D.D. and T.M.S. Ruth Martin, 79, 1415 Country Club drive, died at 12:55 a.m. Wednesday at Perry Memorial hospital where she was admitted Tuesday. Rosary will be at 7:30 p.m. Thursday at Parker Funeral home chapel. Funeral mass will be at 10 a.m. Friday at St. Rose of Lima Catholic church with Rev. Ward J. Pankratz, pastor, officiating. Burial will be at St. Rose of Lima Catholic cemetery. Miss Martin, the daughter of Edwin and Ida Martin, was born at Perry, Oct. 22, 1904. She resided all her life in the Perry community. 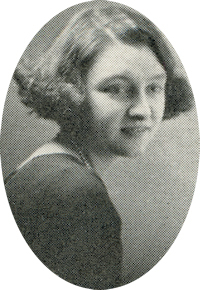 She attended St. Joseph’s academy at Perry and was a 1923 graduate of Perry high school. She attended Central State university and Hills Business College and had been a school teacher in area rural schools. She was a secretary for Cress and Tebbe, Attorneys and had served as manager of the Perry Steam Laundry and Dry Cleaners business. 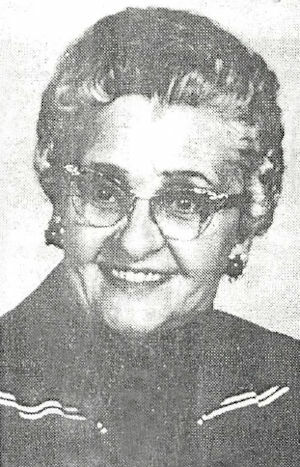 Miss Martin was a member of St. Rose of Lima Catholic church, the Altar society, Noble County Republican Women and the Perry Business Women. Survivors include one sister, Alice Mae Svelan, Perry; and one brother, Ed Martin, of the home.